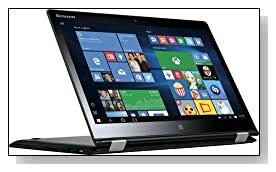 Black Lenovo Yoga 3 80JH0025US is the new 14 inch 2-in-1 touchscreen laptop with a fifth generation dual core Intel i5-5200U processor (3MB cache) at 2.2GHz speed up to 2.7GHz with turbo boost (processor speed will go up to 2.7GHz when you need the extra power and will stay at the base speed for normal tasks and to save on energy) and hyper threading for smart four way processing, 8GB DDR3L SDRAM at 1600MHz for decent multitasking, 256GB Solid State Drive for greater speed including much faster boot ups and ample storage space and Windows 8.1 operating system preinstalled which you can upgrade to Windows 10 which also adds to the speed of boot up for free. Intel i5-5200U can easily handle any multimedia and office tasks as well the very demanding stuff and plenty of multitasking with a Passmark benchmark score of over 3500 and consumes less energy as an ultra low voltage processor. 14 inch LED backlit LCD FHD widescreen 10-point capacitive multitouch display for easy navigation, with 1920 x 1080 pixel resolution and 16:9 image aspect ratio offers great image quality with rich detail, IPS panel with up to 178 degree viewing angles. It includes an integrated webcam with microphone to chat live with family and friends and the graphics card is the Intel HD 5500 that will allow you to play the latest games of 2015 at only the lower settings. Lenovo Yoga 3 weighs just 3.52 pounds and has the dimensions of 13.19 x 9.06 x 0.72 inches- very lightweight, slim and portable and with 4-cell lithium polymer battery lasting around 8-9 hours in real life on a single charge. There is no 10 key numpad on the keyboard but is backlit for comfy and accurate typing in the dark. There is no optical drive but you can certainly connect an external DVD drive and you have the fast 802.11ac wireless, Bluetooth 4.0 to link to other Bluetooth enabled devices, 4-in-1 Media Card Reader that supports SD, SDHC, SDXC and MMC formats, 2 x USB 3.0 ports for much faster data transfers and 1 x USB 2.0 port, an HDMI output and Dragon Assistant voice recognition software for controlling things by speech. Conclusion: Thanks to Lenovo Yoga 3’s 360 degree hinge you may quickly switch between four different modes of tablet, stand, tent and laptop modes. You won’t get much junkware that you need to uninstall but will get a trial version of Microsoft Office 2013 and a free upgrade to the newest Windows 10 as a current Win 8 user (the new Windows is out since the end of July). One major drawback pointed out by the customers is that the exterior is a little prone to fingerprints and you may need to clean it a little more than normal. It looks very sleek and modern, Full HD screen with IPS panel is quite impressive, hinges and the laptop overall feel solid and durable, the backlit keyboard is ergonomic and very comfy to type on, runs quickly and smoothly, has quality speakers, is a very versatile and decent computer at an affordable price, also with the SSD prices coming down you have a good size SSD here. We see it being compared to Macbook in reviews and customers don’t seem to regret their decision to choose this one over an Apple machine at almost half the price of a Macbook Pro. It is good for home entertainment, school and work use and can be taken around easily with its super portable design and decent battery life. Convertible or hybrid machines tend to be much more expensive than regular laptop models but you’re definitely getting your money’s worth here, with also not having to pay for a separate tablet and laptop.